Unique, innovative solutions for large-scale Agile adoption! Agile methods were initially designed to work with small, single team projects - but the overwhelming success of this methodology made it an appealing alternative for the large-scale business as well. However, scaling agile processes to suit enterprise level projects presents unique challenges. Multi-disciplinary teams must collaborate and interface with other units, often across geographies. Large-scale agile also necessitates coordination between distant stakeholders and development teams. An agile transformation across the enterprise necessitates better communication between agile teams, better planning, and better synchronization. There are a number of agile frameworks that focus on overcoming the challenges faced when scaling delivery. The more popular among these are the Scaled Agile Framework (SAFe®), Large Scale Scrum(LeSS), Disciplined Agile Delivery (DAD), Leading Agile and others. 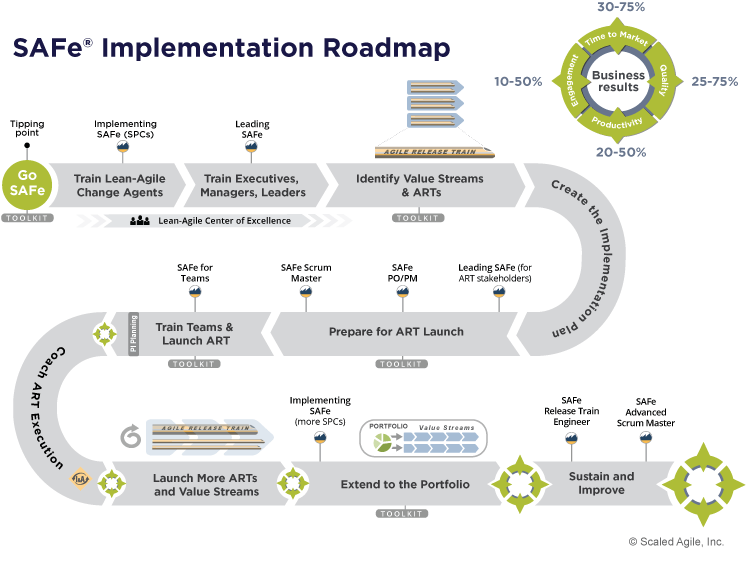 Of all these frameworks, SAFe® is the most used and offers advanced capabilities for easing the path of an enterprise-wide agile transformation. Taking agile from the team to the enterprise! SAFe® developed by Dean Leffingwell is a proven and publicly available framework that is based on lean and agile principles including Scrum, Kanban and Extreme Programming. It develops and helps deliver solutions that enable organizations to scale agile rapidly and deliver to customer expectations. By addressing three key levels of scaling namely portfolio, program and team, SAFe® offers measureable improvements in productivity, quality, customer satisfaction, employee engagement and faster time to market. Please check http://www.scaledagileframework.com/ for the latest details. How can KnowledgeHut help in your scaled agile transformation process? Change can be stressful, especially when it comes to adopting an entire mind-set and processes that are radically new. What organizations need to seamlessly adopt Agile, is a planned agenda that will help them become agile self-sufficient. This is where KnowledgeHut can help. We take the same approach as suggested by the Scaled Agile Academy - Implementing SAFe 1-2-3. Please check http://www.scaledagileframework.com/implementation-roadmap/ for the latest details. In our many years as agile strategists, we have helped numerous organizations train their staff and leverage SAFe® for enterprise benefit. Our team of experienced SAFe® Program Consultants (SPCs), SAFe® Agilists (SAs) and SAFe® Practitioners (SPs) lead Scale Agile Framework services through a set of complex processes that are well-defined and designed to ensure success in the program and portfolio levels. Any successful implementation of SAFe® is dependent upon an intimate understanding of the organization, its culture and set up. We make a conscious attempt to identify all key stakeholders, starting at the top including top level executives, IT architects, senior product managers, and engineering leaders. It is important to understand where an organization is in its maturity curve with respect to agile and agile processes. We do a quick assessment of how much and how well agile has been adopted within the organization and develop training tools and schedules to allow organizations to scale up the agile maturity curve to enable a successful implementation of SAFe® principles and practices. Change agents are crucial to affecting this transformation. Our SAFe® Program Consultants with their years of experience will not only chart out a roadmap that defines the principles and practices of SAFe® and establish a Lean Agile centre of excellence, but also identify from within your organization leaders and agilists who can successfully carry forth the agile transformation process. Leading SAFe®4.5 training: Undertaking this training workshop is one of the pre-requisites for appearing for the SAFe® Agilist certification exam. The workshop helps participants gain the knowledge needed to lead agile transformation within the enterprise using the Scaled Agile Framework ® and its underlying principles of flexibility, lean thinking and product development flow. SAFe® Product Owner/Product Manager(4.5)training: This is again a 2-day intensive program aimed at helping participants aim for a first time pass of the online examination that will certify them as SAFe®Product Owner/Product Manager (SPOPM). The program aims at familiarising Agile practitioners on principles of SAFe®, Lean thinking tools, agile development practices at scale, and an overview of the Scaled Agile Framework®. SAFe®4.5 Scrum Master with SSM Certification training: This 2 day program is aimed at helping your employees clear the SAFe® 4 Scrum Master exam and get practical expertise at being effective Scrum Masters. The workshop with its numerous hands on exercises and case studies helps you gain the knowledge needed to seamlessly adopt SAFe®. SAFe® 4.5 for Teams: A 2-day intensive program that teaches Scrum principles, and goes beyond fundamental learning to include Lean thinking tools, roles and processes. Ideal for new teams in an enterprise agile adoption program, or existing Scrum teams that need restructuring for scaling. SAFe® 4.5 Release Train Engineer Certification training: This experiential 3-day course offers exam prep and eligibility to take the SAFe® RTE Exam. 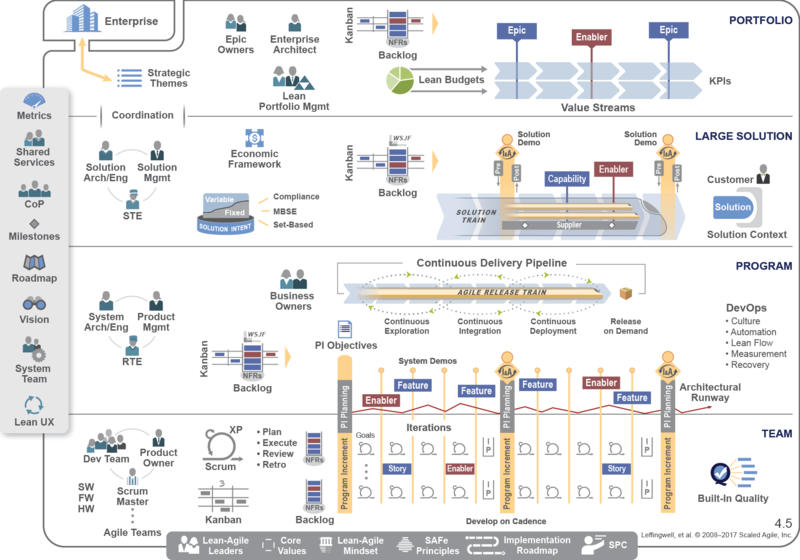 Release Train Engineers facilitate the Release Train, helping to escalate impediments, mitigate risks, create value delivery and foster improvement. SAFe® 4.5 Advanced Scrum Master with SASM Certification training: This is a 2-day intensive preparatory help for the SAFe® Advanced Scrum Master (SASM) exam, by the end of which participants will have the knowledge needed to extend Scrum to the enterprise level.